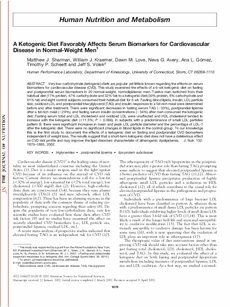 Very low-carbohydrate (ketogenic) diets are popular yet little is known regarding the effects on serum biomarkers for cardiovascular disease (CVD). This study examined the effects of a 6-wk ketogenic diet on fasting and postprandial serum biomarkers in 20 normal-weight, normolipidemic men. Twelve men switched from their habitual diet (17% protein, 47% carbohydrate and 32% fat) to a ketogenic diet (30% protein, 8% carbohydrate and 61% fat) and eight control subjects consumed their habitual diet for 6 wk. Fasting blood lipids, insulin, LDL particle size, oxidized LDL and postprandial triacylglycerol (TAG) and insulin responses to a fat-rich meal were determined before and after treatment. There were significant decreases in fasting serum TAG (-33%), postprandial lipemia after a fat-rich meal (-29%), and fasting serum insulin concentrations (-34%) after men consumed the ketogenic diet. Fasting serum total and LDL cholesterol and oxidized LDL were unaffected and HDL cholesterol tended to increase with the ketogenic diet (+11.5%; P = 0.066). In subjects with a predominance of small LDL particles pattern B, there were significant increases in mean and peak LDL particle diameter and the percentage of LDL-1 after the ketogenic diet. There were no significant changes in blood lipids in the control group. To our knowledge this is the first study to document the effects of a ketogenic diet on fasting and postprandial CVD biomarkers independent of weight loss. The results suggest that a short-term ketogenic diet does not have a deleterious effect on CVD risk profile and may improve the lipid disorders characteristic of atherogenic dyslipidemia.